If you have been involved in a serious automobile accident in Phoenix Arizona and suffered a serious car accident injury or extensive car damage, you may consider contacting a Phoenix car accident lawyer to file a car accident injury claim to get fair compensation for car accident. Automobile accidents, and especially minor fender bender car wrecks can happen to anyone, at anytime. With more than 4,882,000 drivers licensed in the state of Arizona in the year 2014 alone, according to the Arizona Department of Transportation Motor Vehicle Division, car accidents are an inevitability that are simply waiting to happen. Nearly five million licenses–2,853,566–are issued in Maricopa County, making Phoenix (nestled in the heart of Maricopa) a hot spot for accidents to occur. In fact, in the year 2014, the Arizona Department of Transportation reported that there were a total of 109,554 total accidents recorded in the state, according to 2014 Arizona Crash Facts Summary. Of the total 109,554 car accidents, 708 were fatal. In Maricopa County, 79,476 car crashes occurred, 349 of them were fatal, and 368 persons were killed in car accidents. Injury crashes characterized 24,575 of recorded crashes, leading to 36,527 injuries. Needless to say that attorneys for car accidents file many auto accident claims that result in millions of dollars of car accident settlements. Car accidents occur for a variety of reasons, but most often because of driver fault. While weather and road conditions can absolutely add to the risk of a car accident occurring, the majority of car accident are preventable but for the unsafe actions of the drivers involved. Speeding, distracted driving, drunk driving, failing to follow traffic laws, aggressive driving, and driving while impaired can all cause accidents in Phoenix. Sometimes a car accident injury attorney can help decipher police records and use the information to help the victim get a larger car accident injury settlement. Above, data was cited about the number of fatalities reported in Arizona as a result of car accidents. But fatalities are not the only types of tragedies that car accidents can lead to; a people sustaining injuries from car accidents may experience permanent and life-altering disability. This can include brain injuries that permanently inhibit a person’s ability to maintain intimate relationship, hold a job, or live a normal life; spinal cord and back injuries that result in paralysis, forever preventing a person from moving on his or her own again; amputation injuries that require a person to re-learn movements; and psychological injuries that can leave a person in shock, depressed, unable to work, and more. This list of injuries is not all-inclusive; there are dozens of other injury types that are both devastating and permanent in nature and will, in varying degrees, auto accident compensation and a good auto accident injury lawyer that can effectively represent an auto accident lawsuit. There are thousands of people involved car accident lawsuits. This can really be draining to deal with all the legal red tape in trying to get a fair car accident claim settlement if you do not have experience. This is the reason to contact a good Phoenix auto accident attorney for a free evaluation. Keep in mind, a car accident solicitor gets paid only on how well he does in winning the car accident claim settlement for you. In Phoenix AZ Who Is Liable for Injuries From Car Accidents? Liability for car accidents in Phoenix is based on who caused the accident. While sometimes fault is obvious–such as in the case of a drunk driver–other times, it is much more elusive, and this where auto accident lawyers are very beneficial. When a driver cannot be found, is uninsured, or has a low insurance policy limit threshold, things can be even more complicated and the victim should look for the best car accident injury lawyer in Phoenix. The reason to contact a Phoenix car accident attorney is simply, the lawyer for car accident injury is able to provide the best car accident advice on getting you the best return for a wide variety of car accident compensation claims. Car accidents that involve third parties–such as the manufacturer of a defective car product–are also complex. Often times, determining liability requires delving deep into what happened, why it happened, and what could have prevented the accident. This requires the collection of evidence, the opinions of crash reconstruction experts, forensic experts, and more. Concerning Car Accident Injury Claims What Can a Auto Accident Law Firm and Phoenix Car Accident Lawyers Help Me Recover? You are also probably wondering what damages you can recover in a car accident lawsuit. The answer is: it depends. The amount of compensation that you recover will depend upon negligence, whether or not your own fault contributed to the accident, and the extent of damages that you suffered as a result of the accident. In a perfect scenario, you would be able to recover compensation for the full value of your medical expenses, your lost wages, your property damage, your pain and suffering, your incurred disability, your loss of earning capacity, and all other economic and non-economic losses that you have suffered. If you are reading this guide as the survivor of a loved one who has recently died in a car accident, you should know that you too are able to recover compensation on your loved one’s behalf. In Arizona, those are legally allowed to file wrongful death claims for compensation include the surviving spouse of the decedent, any surviving children, a surviving parent or guardian, or the personal representative of any of the above persons or of the decedent him or herself. In a wrongful death claim, you can recover many of the same damages types listed above, as well as compensation for funeral and burial expenses, the lost value of household services of the decedent, loss of care and companionship, loss of guidance, and compensation for your own pain and suffering. When you have been injured in a car accident, is is very important that you understand how comparative fault may play a role in your car accident claim or lawsuit. Also referred to as comparative negligence, this law states that while you are not barred from recovering compensation if you are partially at fault for an accident (assuming your degree of fault is less than 50 percent), your compensation amount will be reduced by your degree of fault. For example, if the other driver in a car accident was 80 percent at fault for your accident, then your total auto accident settlement amount would be reduced by 20 percent (your percentage of fault). If you lost $100,000 worth of damages in the accident, then, you can only recover $80,000. How to Prove Injuries: When you have been injured, the last thing that you want to worry about is proving that your injuries were caused by the accident, or proving the extent of the injuries that you suffered. Unfortunately, doing both will be essential to recovering the amount of money you are entitled to. We will guide you through how to prove your injuries, including providing medical evidence, using photographs, and having medical experts testify on your behalf. A Car Accident Lawyer Can Help You Deal with Insurance Adjusters to Get the Best Auto accident settlement: While you may believe that your insurance company is on your side, it is unlikely. Insurance adjusters are often looking for any way to low-ball your claim, ranging from putting the fault of the accident on your shoulders to disproving the extent of injuries that you have suffered. Dealing with an insurance adjuster can be tricky, and you need to be sure of absolute professionalism on your end, never signing anything without fully understanding its repercussions first, and what to say and not to say to protect your best interests. If your insurance adjuster is working against your best interests, you can search Online for auto accident law firms with experienced car accident lawyer that can help you to fight back. Contact our Phoenix car accident law firms in Arizona to find the best car accident lawyer available to at least answer your questions. Whether or Not You Need a Phoenix Car Accident Lawyer: Hiring an attorney is not a requirement in Phoenix, but it can help you to get your full settlement amount. Attorneys for car accidents can advocate on your behalf, help you to prove the extent of damages that you have suffered, and represent you during the negotiations and settlement process. And, our accident and injury solicitors work on a contingency-fee basis, meaning that you will never have to pay for our services unless your claim is successful. Accidents with Uninsured Drivers: When an uninsured motorist causes an accident that results in damages for you, knowing how you will pay for those damages can be nerve racking. Whether or not you have an uninsured or underinsured policy as part of your own insurance, car accident lawyer can help to explore what the best option is for moving forward, including filing a lawsuit. We will also help you to other explore other insurance types on your own policy that may help to pay for your injuries when the other driver is uninsured. Drunk Driving Accidents: Accidents with drunk drivers are often the most severe of all accident types, resulting in injuries that can be permanently life-changing, or even fatal. If a drunk driver has hit you, you deserve every penny of your losses paid, including both economic and non-economic compensation for car accident involving a drunk driver. A car accident lawyer can help you to gather the evidence you need to prove the fault of the intoxicated driver, and will work with you understand the difference between criminal and civil penalties for a drunk driving offense in Arizona, and help you file a car accident lawsuit and other auto accident claims. Statute of Limitations for Filing a Claim: In Arizona, there is a statute of limitations, or time limit, for filing a car accident claim in civil court against the at-fault driver. The time limit in Arizona for bringing forth a civil action is two years. In most cases, you cannot file a claim after two years, meaning that you have lost your right to recovery after this time. The Cost of a Car Accident Lawyer: Most people believe that auto accident claims filed by auto accident attorneys is unaffordable. However, when you hire an attorney who works on a contingency fee based system, he or she does not get paid unless and until you do. We will explain a contingency fee system in more depth later on in this guide, and why it is an affordable option when you need legal representation. The Law Regarding a personal Injury Car Accident Involving a Rear-end Collision: Contrary to popular belief, a rear-end collision is not always the fault of the rear driver. In fact, there are many circumstances that can affect fault. If you have been in a rear-end collision and have questions about how to recover compensation and who to hold liable, we have answers. 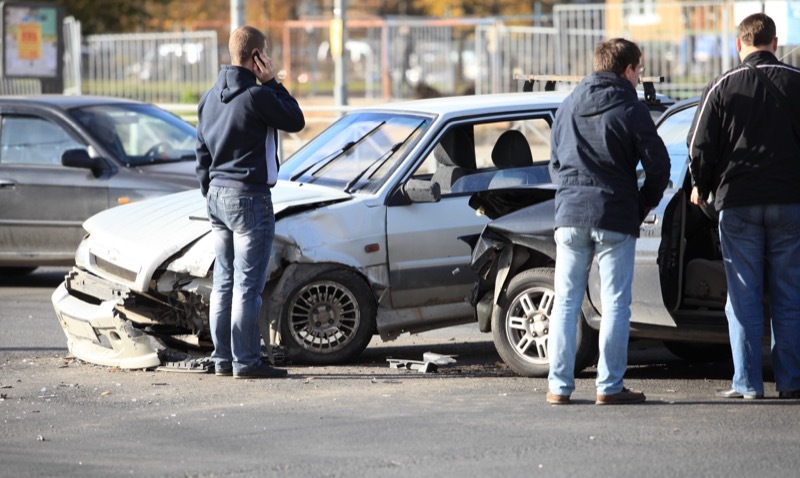 Car Accidents FAQs: What should I do in the immediate aftermath of my car accident? What if I cannot pay my medical bills? What do I do if my insurance company denies my claim? After a car accident, you are bound to have some pressing questions. This car accident city guide will offer comprehensive answers to your most immediate car accident questions. What To Do If You Are Acting as a Passenger At the Time of Accident: Car accidents do not always cause injuries to the drivers of the vehicles alone; often times, passengers are adversely affected too. If you have been injured in a car accident where you were the passenger at the time of collision, you need to familiarize yourself with your rights when it comes to filing a claim and getting the money you deserve. Bicycle Accidents: Bicyclists have little protection from injury when involved in an accident with a motor vehicle. As such, the harm incurred by bicyclists is often severe. Regardless of whether or not you were on a bike or in a car at the time of your collision, you deserve benefits. In many cases, car insurance policies will cover injuries incurred to bicyclists, too. Motorcycle Accidents: Motorcycle accidents happen all-too-often in Phoenix, leading to devastating injuries. If you have been in a motorcycle accident, we can help you to understand who might be held liable, how your own actions may affect your claim, and what types of damages you may be able to recover. Truck Accidents: Thousands of commercial vehicles and large trucks travel through Phoenix every year. While these vehicles serve a very important need–the transportation and distribution of products and goods–when involved in accident, the drivers and passengers of passenger vehicles rarely stand a chance. Truck accidents can be especially confusing, as there are many parties who may be held liable, rather than just one or two. An attorney can help you to understand how negligence applies in a truck accident case and how to prove it. Pedestrian Accidents: Perhaps the most tragic accident type of all are those accidents involving pedestrians. When a pedestrian is hit by a motor vehicle, he or she may incur serious and permanent injuries, including traumatic brain injuries, spinal cord injuries, and loss of limb injuries. While pedestrians do not always have the right of way, they do have protections under the law that are very important in a car accident case. Each of the topic areas above will be explored in more depth throughout this city guide. We understand that being involved in a car accident is a very emotional process, and that knowing what to do can be extremely overwhelming. More than anything, however, we cannot urge enough the importance of a legal advocate in the aftermath of a car accident. If at any point in the process you need to talk with a Phoenix car accident lawyer, we encourage you to call our offices immediately.